I want to thank you for taking good care of yourself and for realizing that forgiveness is vital to your happiness! In fact, this is a fabulous double whammy gift because you will also learn about gratitude, which is also vital to having healthy relationships. Forgiveness Teacher and Author of Forgiveness: Heal Your Past and Find the Peace You Deserve, Lori Rubenstein, JD, CPC teaches that forgiveness does not mean allowing someone to hurt you over and over again. In fact the very best relationships are those where people forgive each other easily. With practice, you can steadily build your forgiveness muscles and live your life in a state of peace and acceptance of all that is and all that comes your way! 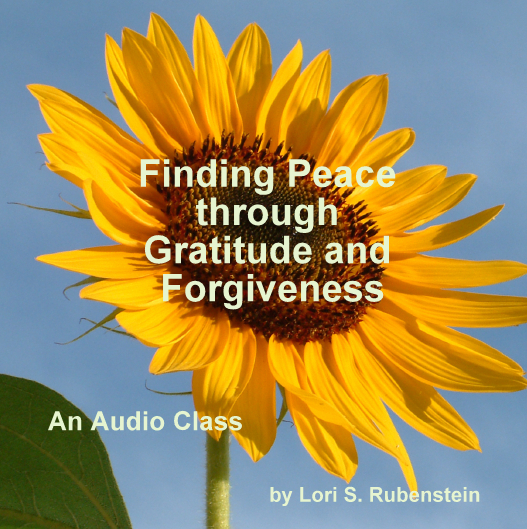 And enjoy Lori’s gratitude meditation, which you can listen to daily! Just fill in your name and email and you will receive the free audio and a subscription to my informative monthly newsletter! I know the sign up looks a little odd, but it works 😉 . Enjoy your free Forgiveness and Gratitude Class Now!